Afghanische Millionen von den Taliban? Der Sergeant gibt sich einen offiziellen Anstrich mir der .mil Endung in seiner mail. I am Sgt.Williams Moore, I have a good business proposal for you. There are no risks involved and it is easy. Please reply for briefs and procedures. Subject: E-Mail From Sgt. Williams Moore! Apr 9. 21012 to williamsmore. Das täte mich interessieren wie das mit dem Geschäft zugeht. Schreib mir doch mal was Näheres. Thanks for your response to my email requesting your assistance. Please take your time to read and understand this email as it contains the details of plans and requirements to conclude this venture. Most importantly I do not want this to go through banks around here, It will not be safe, I have a very good, trusted and reliable diplomatic courier contact used mostly by our forces in Jordan, that can send goods easily through diplomatic and private military way, to anywhere in the world, without them being checked at any port of entry. We must keep a low profile as a result of the amount in question. I need your help, you just have to follow my instructions. The fund in question was realized from oil proceeds," Oil money" as fundly referred to by the merchants out here. I can make arrangement to deliver the Candy's (funds) to any address of your choice. The baggage will be tagged diplomatic documents, and the courier company, will not know the contents of the boxes. A few friends have used this means without being checked because of the diplomatic immunity they enjoy. Their charges are moderate, I will negotiate a way out from this end, till it gets to your door step and I will follow up immediately and meet with you for disbursement after you have received it. I will send the total since I can not keep cash on me. But can I trust you? Once the funds get to you, you take your 30% and keep our 70%. Your own part is to find a safe place where the funds can be sent to. Ours is sending it to you. What do you do for a living? are you Married with kids? can you handle this funds ? We need to build trust!! It's just me and a colleague that knows about this transaction from this end, so try and keep this between the parties involved. If you are not capable of handling this huge sum, Please do let me know. Keep in mind at all time the need for confidentiality and absolute secrecy before we conclude this transaction. Phone conversation is not a safe measure in this endeavor. Remember to keep our secret. I cannot call you on the phone or receive fax, as I am not always in the office as a result of my operational schedule. Hope you are ok with this? Everything must be done by email. Will you still help? I need your urgent reply in this regard. Brooke Cypress Apr 10 to williamsmore.sgt. Also ich habe das so einigermaßen verstanden. Du hast das Geld und ein diplomat wird bestochen und bringt es zu mir. Damit bin ich einverstanden, aber mit deiner Aufteilung nicht. 70 / 30. Das machen wir anders. Ich schlage vor du gibst mir 40, du nimmst dir 55 und die restlichen 5 nehmen wir für unvorhergesehene Zwischenfälle. Sag mir nun wie es weitergeht, wann kommt der diplomat und wie groß und wi schwer ist das Geld? Weil ich muß doch Platz machen für den Koffer oder wo immer das drin ist und der soll ja nicht mitten in der Wohnung stehen. Ach so soll ich den Diplomaten zu einem Täßchen Kaffee einladen oder einem Gläßchen Puffbrause? Mach ich doch gern und wenn er ein schnuckeliges Schnurzelchen ist, wer weiß? Also Willi meld dich bald. Willi weigert sich und schiebt den Partner vor. Thank you for your prompt response, My partner is not willing to give you 40% but 30% but I am still trying to sort things out so you should try as much as you can to provide your full name and address and tell me what you do for a living? I will want your identification. I will want shipment to take place today. Was ist hier los? Ich denk das ist nur was zwischen dir und mir, das Geschäft! Was soll der Partner auf einmal? Ich glaube du hast den nur erfunden um den Löwenanteil zu erhalten. Bevor ich dir was von mir schicke, will ich erstmal Beweise für die Existenz des Geldes sehen und von dir deine Army Id card und die deines Partners. Und dann, hör genau zu Sergant! Ich will von euch beiden, DEM PARTNER UND DIR; ein Bild was euch beide zeigt UND ihr haltet die aktuelle Stars & Stripes in der Hand, so daß ich das Datum sehen kann. Also William, das will ich und dann läuft das Geschäft. Williams Moore williamsmore.sgt@gmx.com Apr 11. Thanks for your reply but my friend is involved in this transaction but he is not here now he has been stationed to Afghanistan so I don't think your request can be possible so if you are willing to work as partner then lets make this happen. Brooke Cypress Apr.12.2012 to williamsmore.s. Wenn das Geld durch 3 geht, dann ok. Zum Zeichen meines guten Willens schick ich dir meinen Ausweis-scan. Dafür will im Gegenzug den von dir und deinem Freund. Ich will wissen mit wem ich Geschäfte mache. Einen Beweis für das Geld will ich auch. Please send me your phone number I need to talk to you. Brooke Cypress 5:24 PM Apr.12.2012 to williamsmore.s. Phone conversation is not a safe measure in this endeavor. Everything must be done by email. Also nix mit telefonieren mein lieber Kokoschinsky. Schick erstmal deine Army ID card und die von deinem Freund. vorher passiert garnix. Brooke Cypress 9:10 PM Apr 16. 2012 to williamsmore.s. War doch deine Idee nur mit mails, warum willst du auf einmal telefonieren? Brooke Cypress 7:17 PM Apr 17. 2012 to williamsmore.s. aber keine Sauereien, nur geschäftlich. Thanks for you phone number I will want you to send me your full address and name because shipment will take place tonight if I have your information. Brooke Cypress 9:33 AM Apr. 18. 2012 to williamsmore.s. Damit du weißt wo es hingehen soll, schick ich dir meine Adresse. Allerdings will ich vorher wissen wie du aussiehst. Also ganz fix die ID card gescannt und geschickt. Und den Namen deines anderen Partners will ich auch wissen. 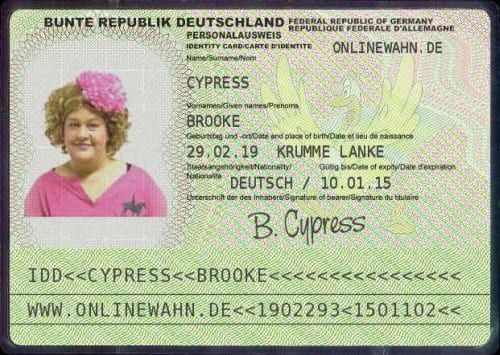 Brooke ist sauer, der Kerl ruft nicht an. Brooke Cypress 7:25 PM May 04. 2012 to williamsmore.s. Was ist los? du hast die Telefonnummer und rufst nicht an. Ich will endlich wissen woran ich bin, wegen deiner hab ich schon ein tolles date verpasst, nur weil ich zu Hause auf deinen anruf gewartet habe. Sgt. Williams Moore hat sich nicht mehr gemeldet. Entweder hat er Verdacht geschöpft oder ein lohnenderes Opfer gefunden. Egal, das Internet ist voll von solchen mails und jeden Tag ist was Neues im spam Ordner. Der header mit der .mil Endung zeigt keine IP. Da aber der return-path zu .gmx geht, wird hier sein Standort verraten.